Bats…they’re ubiquitous creatures at every spooky house. Who knows why they have a thing for old mansions. Maybe there are lots of dark nooks and crannies to hang upside down. Fast forward to your next Halloween party, and imagine hanging this 15 Inch Bat Prop in an inconspicuous location and waiting for your guests to scream in terror. Yes, this bat is the perfect prank item! May we suggest that you name him and adopt him as a pet? 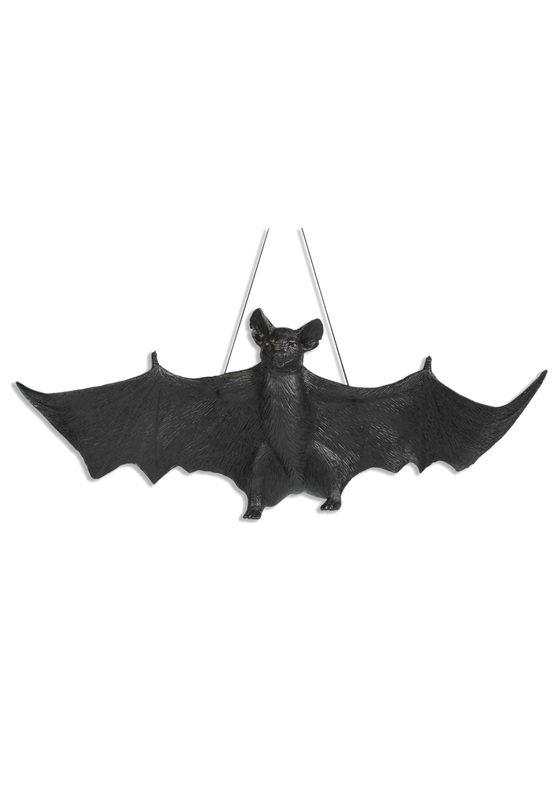 This black plastic bat has green eyes and floppy wings, which we think makes him truly adorable. It can be hung using the elastic band that is attached to the top of the wings of the bat or by five suction cups on the underside. Great for scaring even the bravest of your friends! We understand these bats are fiercely loyal to their families, and spend many years of service scaring the bejeebers out of unsuspecting friends. Treat it well and he won’t fly away to the nearest mansion...just keep him happy by placing him in a dark box when not in use.